Having just filed his 2016 taxes, a Zero Hedge reader submits the following bizarre story. On January 20, the reader filed his Federal tax return using Tim Geithner’s favorite TurboTax software, which the IRS formally accepted three days later, on January 24. 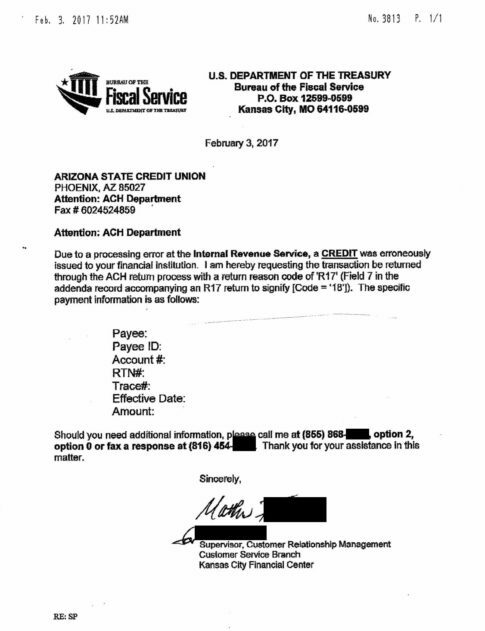 One week later, on January 31, the IRS made an automatic deposit into the reader’s bank account, who then used the refund to pay down his credit card debt the very next day. “the IRS emptied our bank account February 3, 2017 for erroneous refund with no notice! (please see attached letter). The only other thing I could think of was that TurboTax did not work correctly and calculated to large of a refund but the letter from the IRS stated it was a “processing error at the Internal Revenue Service”. The refund we received was the same as what TurboTax calculated. I researched the IRS manual about erroneous refunds and could not find anything referring to a “R17” code as stated in the letter. Called them. Our return was fine. The amount of refund was fine. Not an identity theft problem. Error on their side. According to the person I spoke with they are doing this to a large block of filers. They seemed hesitant to give more info. So, as our reader summarizes, “no outstanding taxes. Never been audited. Always file on time. Not a small business, just a normal employee W2, not a structuring issue. Only typical deductions and student loan interest. Scrambling to cancel auto payments and trying to figure out how we will pay mortgage and any payment that will not accept credit card. Go after third party transferees of your assets. … but all of the above are only permitted in the course of “due process”, when an individual taxpayer has been found in violation of US tax laws. In this case the IRS counterparty was in no way at fault, and was merely the lucky recipient of a clerical IRS error, in the IRS’ own words, without any justification or validation. That the IRS would then have full liberty to indirectly enter the account with no warning, and take out whatever funds it deemed appropriate – again, with no explanation of just what the “error” was – is sufficiently disturbing, and is why the person who this happened to would like to know if it has happened to other ZH readers and if so, does he have any legal rights in this particular case. seemingly, we are fake citizens if necessary.